I want to go into a shop to buy a bottle of whisky. A theologian might ask should a Christian buy and drink alcohol? and he may want to discuss the issue with me using the Scripture. If an ethicist were watching, as an ethicist, he might ask where is the best place to buy the whiskey, should I buy fair trade whiskey? Should I spend more than £40 on a single malt when a blended can be bought for under £20? A jurist might discuss the times that it legal to buy the bottle and ask is it right that so much of the price of a bottle of whisky (in the UK) is tax. An aesthetician would consider the size and shape of the bottle and the colour of the whisky, the way it is packaged, he might also pay attention to the display of the bottles in the shop and the way the shop is laid out. An economist might be primarily be interested in the cost and value of the bottle. A sociologist looking on might consider the impact of alcohol on society and she might also look at the interaction between the shopkeeper and myself. The ways of communicating between the customers and the shop keeper would come under consideration by the linguist, she might wonder about my Potteries accent and the shopkeeper's Bristolian accent; and also ponder what does the label say about the whisky? And what did that wink of the shopkeeper mean? A psychologist might think about what drives me to want a drink of whisky and what motivates the shopkeeper to please me. The bottle of whisky itself also has a number of aspects: there are a certain number of bottles on the shelf, each take up a certain amount of space, the whiskey in the bottle could be described by a chemical formula, but of course it is more than that, the whisky stays on the shelf because it obeys Newton's laws of motion and so on. This apparently simple task of buying a bottle of whisky has many facets to it; this idea of the multifaceted-ness of reality is to be found in the thought and writings of the Dutch lawyer and philosopher Herman Dooyeweerd(1894-1977). Dooyeweerd was one of the major architects of what is known as Reformational philosophy; it has also been called the cosmonomic idea - a translation of the Dutch de Wijsbegerte der Wetsidee [WdW] - and the Amsterdam school. Dooyeweerd is one of a number of Dutch Calvinists who were associated with philosophy. The notable others were his brother-in-law Vollenhoven, H. Van Riessen (b. 1911), J. P. A. Mekkes (1898-1987) [wikipedia link], K. J. Popma (1905-1987), the S. African H. G. Stoker (1899-1993) and S. U. Zuidema (1906-1975). Van Prinster was an aristocratic Dutchman. He studied at the Calvinistic University of Leyden. He became a Christian in Brussels under the preaching of J. M. Merle d'Aubigne. His Unbelief and Revolution (1847) was an important work. He argued that the elimination of Christianity from public life could only result in violent revolution. He was the founder of the Dutch Anti-revolutionary Party (the revolution in question being the French). The party never really flourished until van Prinster found in Abraham Kuyper a natural successor (Rodgers 1992). He took over the leadership of the Anti-Revolutionary party from Van Prinster and eventually became Prime Minister (1901-5). He founded a Christian university, The Free University, in Amsterdam and was editor of a daily newspaper. He also found time to write over 200 books and articles. His main works include The Principles of Sacred Theology (1980), The Work of the Holy Spirit (1946) and the 1898 Stone Lectures: Lectures on Calvinism (1931). In the latter, he developed the idea of Calvinism as a Weltanschauung, a whole 'world-and-life-view'; his Calvinism was not a narrow five points! A full account of Kuyper's life and work, can be found in Vanden Berg's biography (1978) and in McGoldrick (2000). Vollenhoven was Dooyeweerd's brother-in-law. He was a contemporary of Dooyeweerd at the Free University (1911-1914). He studied classics, philosophy and theology. His dissertation in Dutch was on the 'Philosophy of mathematics from a theistic point of view'. He married Dooyeweerd's sister and became a pastor in the Gereformeerde Kerk in Oostkappelle from 1918. In 1921 he became a pastor in The Hague and had many discussions with Dooyeweerd. Vollenhoven then on to become professor of Philosophy at the Free University in Amsterdam. He developed an approach to the history of philosophy that became known as the Consistent Problem-Historical Method (CPHM). Dooyeweerd and Vollenhoven's idea of the cosmological principle has provided many important insights in aesthetics, art, economics, education, feminism, football, mathematics, philosophy, technology, social sciences, dogmatics, as well as science. This alone provides ample evidence of the comprehensiveness of this perspective. It is little known in Britain, but popular in North America ? as a result of the large Dutch immigration. Its systematic nature and the vast majority of works written in Dutch has prevented it making much impact in the UK. Another reason postulated by Richard Russell is the inroads that logical positivism has made in older evangelical leaders (Russell 1992:148). Several secondary sources are available which provide a useful introduction to Reformational philosophy and to Dooyeweerd's thought (Spier, Kalsbeek, Kok, Clouser, Steen, Choi). I will draw upon them in the following. The two main influences on Dooyeweerd are Dutch neo-Calvinism and contemporary German philosophy (Wolters 1985). A few observations of the latter will suffice before outlining the former in more detail. The main German philosophical influences were neo-Kantianism and phenomenology. Dooyeweerd writes: 'Originally I was strongly under the influence first of Kantian philosophy, later on of Husserl's phenomenology.' (NC I:v) Of the neo-Kantians Dooyeweerd had 'particular affinities' with Wilhelm Windelband (1848-1915) and Heinrich Rickert (1863-1936) of the Heidelbergschool. This is particularly seen in the distinction of norms and the laws of nature (Wolters 1985:12). Another philosopher that influenced Dooyeweerd is Nicholai Hartmann (1882-1950). Hartmann also went through a neo-Kantian and a phenomenological phase. Hartman's Influence is seen in Dooyeweerd's modal aspects; though Dooyeweerd's work is more developed and sophisticated than Hartman's. Hartman also postulated different ontological levels each of which was irreducible to the previous (Wolters 1985). The neo-Calvinist influence on Dooyeweerd is more marked. Dooyeweerd's main work is the three-volumed New Critique of Theoretical Thought (four including the extensive index!) The main thesis of the first volume is that 'an intrinsic connection exists between a philosopher's theoretical activity and his religious faith' (Freeman 1958: 46). The subsequent volumes developed a systematic philosophy based on the Christian 'ground motive' of creation, fall and redemption. 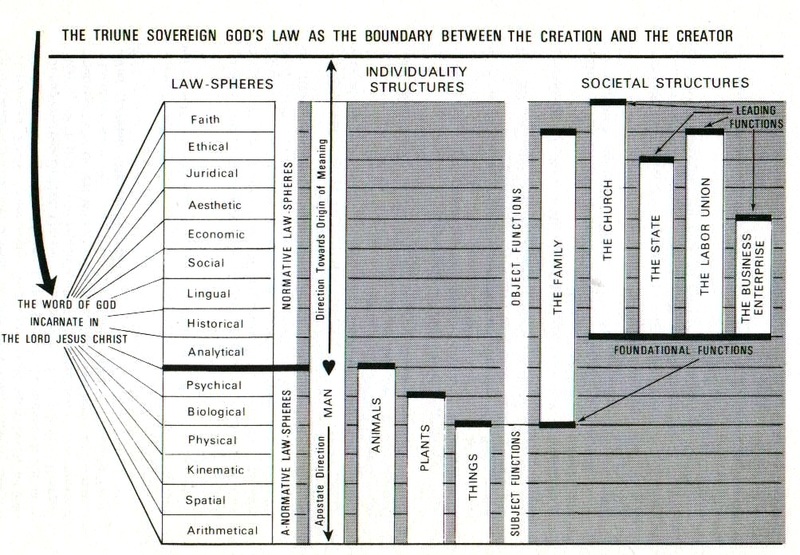 Several themes dominate Reformational philosophy most of these arise out of the sovereignty of God, sphere sovereignty and the necessary distinction between creator and creation. Both of which are neo-Calvinist in origin. Bernard Zysla in his introduction in Kalsbeek (1975: 31) writes: 'the most important premise of this philosophy lies in its assumption that reality is created by God whose will is the sovereign and redeeming law for reality'. The sovereignty of God. It was Abraham Kuyper who declared: 'There is not a single square inch of the entire cosmos of which Christ the sovereign Lord of all does not say, "This is mine".' This sums up the motivation of the Reformational philosophy: to reassert the lordship of Christ in every area of life. God's sovereignty means that he is lord of all including art, history, philosophy, theology, business, politics, mathematics, science, ... .
A strong emphasis in Reformational philosophy is the idea of law. Indeed so strong that in Dutch the approach is called the philosophy of the law idea, or cosmological philosophy. Dooyeweerd saw the law as the boundary between God and his creation. God transcends the law, he does not violate it; he is not subject to his own laws. Archimedes placed so much faith in the principle of the lever that he asserted 'give me a place to stand and I will move the world'. This place is the Archimedean point. All philosophies need an 'Archimedean point', a point of reference from which to base its ultimate support. Two classes of philosophy can be distinguished: the immanent and the transcendent. Immanent philosophies place their Archimedean point within philosophy/ creation; transcendent philosophies place it outside philosophy/ creation. An example may help clarify the distinction. Immanent philosophers include Descartes and Kant. Descartes' starting point was thought, and Kant's reason. Reformational philosophy is a transcendent philosophy, its Archimedean point is Christ, who is the source and sustainer of all things. Immanent philosophies are inherently reductionistic and pagan; i.e. they deify an aspect of creation by making it self-existent. Linked to the Archimedean point are religious ground motives. Dooyeweerd identified four 'religious ground motives' that have shaped the development of western culture. These were form/ matter; grace/ nature; freedom/ nature and creation, fall and redemption. The first three are 'internally dualistic and fragmentary', the latter biblical. A useful historical overview of, these ground motives is found in Dooyeweerd (1979). Figure 1. (c) Richard Russell. For Dooyeweerd all things are subjected to God's law and to God. All things include: the heavenly, i.e. angels ? both good and evil; and the earthly. Within the earthly are a diversity of kingdoms, domains or realms: humans, animals, plants and non-living things (human, animal, vegetable and mineral (Hart 1981:268 ff)); within these kingdoms are different kinds. (i) The good - evil difference. The second difference means that this igloo (or whatever) is not that igloo (or whatever). This igloo is different from all other igloos; it has an individuality structure. In an endeavour to describe the unity and diversity of reality Dooyeweerd identified fifteen different modal aspects or law spheres. Each thing that exists is subjected to God in each of these modal aspects. Each of the modal aspects has certain laws or norms associated with them. In order of increasing complexity these modal aspects are: number, space, kinematic, physical, biotic, sensitive, analytical, cultural, linguistic, social, economic, aesthetic, juridical, ethical and faith. All of these dimensions are present in reality and none can be reduced to another, i.e. they are irreducible. Figure 2 E L Hebden Taylor's diagram of the modal aspects. Clouser notes that these modal aspects were arrived at by taking every large-scale kind of properties and laws which has been distinguished in the history of philosophy and science (1991:205). They are not arbitrary. The order of them is also significant. The higher modes presuppose the lower. For example, the economic mode presupposes a social and a lingual mode. Without the social mode what point an economic, and without a lingual how could economic values be communicated? This is not to suggest that the higher modes are more important or that the lower modes are more basic. Each mode equally depends on God. Stafleu (1987) In discussing theories shows how the Pythagoreans, Plato, Descartes and Galileo, and Newton showed the numerical, spatial, kinematic and physical modes, respectively, to be irreducible. These modal aspects or law spheres provide, among other things, an excellent tool to avoid reductionism and to identify idolatries. Each thing has one aspect that is so important that it characterises it, this is called its leading function. The bar in table 1 represents this leading function. The leading function of humans is faith; for animals, sensitive; for plants, biotic; for rocks physical. (This is obviously a broad classification; some Dooyeweerdians suggest that animals may function at higher modes (e.g. Hart 1984:181), another (Zysla 1981) suggests that some single-celled cannot be classed as animals or plants. A distinction is made between subject and object. Every thing has a leading function, or a qualifying aspect. In modes higher than its leading function (sometimes called its superstratum) it has an object function (indicated by the full line in table 1). For all aspects lower than its leading function (sometimes called the substratum) it has a subject function (indicated by the broken line). colour can be perceived, but it cannot perceive itself (sensitive); it cannot name itself but it can be named (lingual); it cannot think, but it can be thought about (analytical); it has a certain economic value but it cannot engage in economics (economic); it can be possessed but it cannot possess (juridical); and so on. Hence, all things have either a subject or an object function in all modal aspects. Humans alone function actively as subjects in all modal aspects. An axe is subject to the law of gravity; so is man. But humanity's humanness is more apparent in their being subject to moral, analytical or juridical norms. Think of the roles and responsibilities of man and an axe in a court session. The axe lies on the table as an exhibit in a, murder case. The defendant has violated moral and juridical norms, but the axe has not. Still, the axe plays a role in these normative aspects; it is not important in the hearing as legal evidence. Its role is that of an object function in the moral and juridical aspects; its subject function ends with the physical (Kalsbeek 1975:122). The cell is the minimal unit capable of independent life. As such it is generally recognized to be the unit structure and function of life. In contrast to molecules, we can refer to a cell as being alive. This is possible because we recognize that the cell functions in a biotic (vital) way. A cell functions in the numerical, spatial and physico-chemical [kinematic and physical] aspects of being. The numerical aspects are apparent in the particular ratio of cell surface to cell volume of each type. If this ratio becomes too small due to increase in volume, the transport of materials across the membrane could limit and thus hinder the functioning of the cell. The cell also possesses a physico-chemical aspect which is evident in the metabolic processes, in which the energy, requirements for the various reactions involved are determined by physico-chemical laws. Furthermore, the colloidal nature of the cytoplasm, is really a physico- chemical function of the cytoplasm even though extremely important for the vital activities of the cell. (Zysla 1977: ch 14). We can apply the fifteen modal aspects to natural science. Natural science is concerned with the numerical, spatial, kinematic, physical and biotic modes; these are the fields of its investigation. Sensitive The impressions received from sense data, and psychological factors are obviously important considerations for the scientist. Analytical Analysis is a vital part of science; it is needed to distinguish between competing theories and hypotheses. 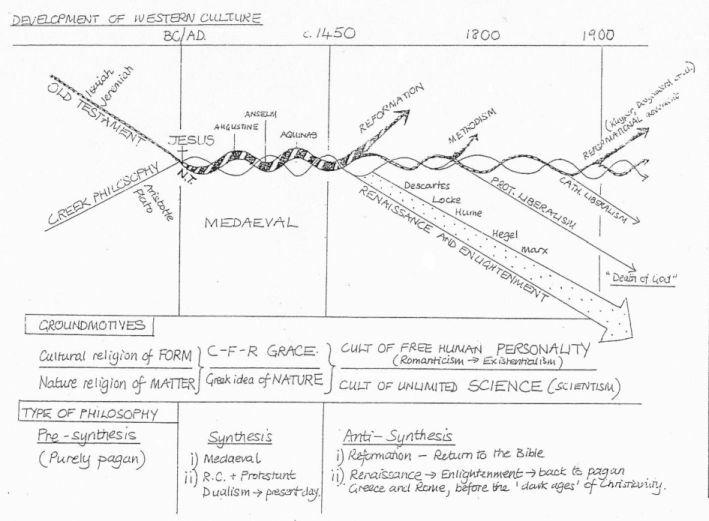 Cultural/ historical Science is performed in a particular cultural milieu and context; it cannot be divorced from it. Lingual Science has its own symbolism: e.g. Mg, MgO. The results of investigations have to be communicated through specialist journals or conferences. The language of which are often unintelligible to a non-expert in the specific field. Social Kuhn, has shown how important the community of scientists is to the advancement or otherwise. Similarly, Polanyi talks about a community of explorers. Economic The restraints of funding means that scientists have to choose their research carefully to have a chance of securing funding: no money, no science. Aesthetic The beauty and simplicity of a theory is one criterion for its validity. Juridicial Scientists have a legal responsibility, they should not break the law no matter how important their research. genetically engineered organisms be released in to the environment, should we clone humans? These are all ethical issues that confront the scientist. Faith Polanyi (as well as Dooyeweerd) has shown how important faith is to science. Despite the fruitfulness, the comprehensiveness and the consistency of this approach it is not without its detractors. One criticism is its lack of wide of acceptance. This is hardly a valid objection: democracy is hardly an arbiter of truth. Reasons for its lack of popularity have in the UK have been mentioned: the inroads of logical positivism, the influence of a Scholasticism and its highly systematic nature. A strait-jacket imposed on reality? As mentioned earlier Diller (1990) raised a number of objections. Not least, he accuses the fifteen modal spheres of being a strait-jacket imposed on reality. Whereas, the modal spheres have arisen out of reality. The fact that there are fifteen of them is not written on tablets of stone; indeed many Dooyeweerdians argue over the number of them and the position of them (see table 2). Olthius (1969) changes the ethical mode to troth, or human faithfulness. Ethics he points out is the discipline that determines 'goodness'; and to be 'economically good' is very different from 'aesthetic goodness'. Many dislike the term 'historical' and have suggested 'historical-cultural', techno-formative and techno-cultural. Clouser prefers not to use nouns to describe the modes: 'nouns' tend to encourage the misunderstanding that these are classes or groups of things' (Clouser 1991: 205). Fowler (1991) in discussions with W.J. Ouveneel (1985) suggests that the sensitive or psychic mode should be replaced by two distinct and irreducible modes of functioning: 'percipient', characterised by the meaning kernel of 'sense perception'; and the 'affective' mode, characterised by 'emotional feeling'. Duncan Roper has also revised the order of the list he places the aesthetic mode is placed earlier than the logical. Fowler (1991: 221) agrees with Roper in moving the aesthetic, as he feels aesthetics is not dependent on cultural formation; he prefers to place it between the logical and historical/ cultural. So rather being a strait?jacket the modes are open to adjustment in the light of observations and insights from reality; they are a response to the experience of reality. Diller's other objections arise primarily over the question of the relationship between philosophy and Christianity. Diller denies that there is a distinctively Christian approach: 'I tend to side with those people [Including Heidegger and Barth] who deny the possibility of Christian philosophy' (1990:140). The Reformational view affirms the existence of Christian philosophy. And for many commentators there is the rub. A denial of the existence of distinctively Christian philosophy implies antagonism to the Reformational philosophy as it claims to be a Christian philosophy. Two important questions must then be addressed and answered affirmatively if the Reformational perspective is not to flounder: (i) is a distinctively Christian philosophy possible? and (ii) is the Reformational perspective distinctively Christian? Is a distinctively Christian philosophy possible? Most contemporary philosophers of science are in agreement that neutrality and objectivity is a fallacy. Our perception of reality is coloured by our worldview. Facts are theory dependent; and theories are worldview dependent. If Christianity is a worldview, then as with any worldview, it determines the shape and framework of theories and consequently facts. It must then mean that a. distinctively Christian approach to, science and the philosophy of science is feasible. Is the Reformational perspective distinctively Christian? To accept a Reformational perspective one needs to accept the biblical distinction between the creator and creation. Everything other than God is creation. Nothing in creation is therefore self?existent; to declare it to be so implies that something is uncreated, which gives it the status of divinity. The Reformational approach therefore comports well with Christian presuppositions. A Reformational approach is then at least prima facle a Christian approach. It should be stressed however that it is a Christian approach and not the Christian approach. Other perspectives may be equally Christian. To accept a plurality of Christian approaches does not deny the validity of any one. Craig Bartholomew In the Fields of the Lord: A Calvin Seerveld Reader Piquant/Tuppence Press, 2000. Yong Joon Choi Dialogue and Antithesis: A Philosophical study on the significance of Herman Dooyeweerd's Transcendental Critique PhD Thesis, Pontchefstroome universiteit vir Christelike Hoer Onderways, 2000. RoyClouser The Myth of Religious Neutrality. University of Notre Dame Press: Notre Dame, 1991. Roy Clouser 1995. The impact of Dooyeweerd's philosophy on the natural sciences: whence the difference? In Christian Philosophy at the Close of the 20th Century. Ed Griffoen & Balk. Kampen Kok. Antoni Diller. Herman Dooyeweerd - a profile of his thought. Spectrum 22:2 Summer 1990. pp. 138- 154. L Kalsbeek Contours of a Christian Philosophy: An Introduction to Herman Dooyeweerd's Thought. Wedge: Toronto, 1975. D. M. Lloyd-Jones ?The French Revolution and after', in The Christian and the State in Revolutionary Times Westminster Conference Papers, 1975. Cambridge: Westminster Conference, 1976. Richard Russell In defence of Dooyeweerd and of Christian philosophy Spectrum 23:2 Summer 1991. Pages 147-159. James W. Skillen. Herman Dooyeweerd's contribution to the philosophy of the social sciences. Journal of the American Scientific Affiliation March 1979. Pages 20-24. D. F. M. Strauss and Michelle Botting (eds) Contemporary Reflections on the Philosophy of Herman Dooyeweerd Edwin Mellen: Lewiston, 2000. Brian Walsh and Jon Chaplin. Dooyeweerd's contribution to a Christian philosophical paradigm. mimeo Institute of Christian Studies, nd. S Wolfe A Key to Dooyeweerd. Presbyterian and Reformed: Nutley, NJ, 1978.